Tennessee-based Lynskey have released three new titanium road frames that aim to make owning a US built titanium frame a little more affordable. They’re headed up under its new Silver Series label, and include the Breakaway, Peloton and the Viale. Each will cost £999.99. 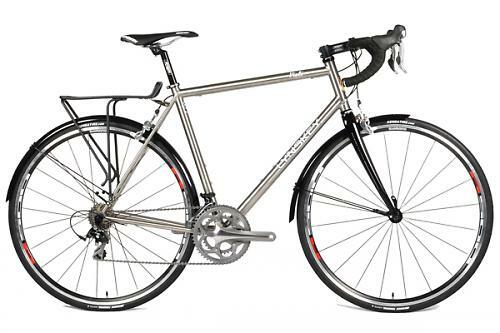 A regular custom made Lynskey, like the extraordinary Helix with its twisted tubes, will set you back the thick end of £3K. So to get a frame made in the same factory as that but costing substantially less is quite impressive. The range includes a road racer, a comfort-oriented model and a light tourer/commuter. They’re each made from 3AL/2.5V straight gauge titanium tubing and carry a lifetime warranty. The Peloton could be considered the ‘sportive’ model, with a taller head tube and shorter top tube placing the bars in a more comfortable position for those who don’t want to stretch out pro-style. For harder riding and racing, the Breakaway has classic racing geometry that is a bit more aggressive than the Peloton, to speed up the handling responses and is lower at the front so you can tuck down low at the front. Both frames have clearance for 28mm tyres however making them versatile choices for year-round riding duties. For a summer of touring duties or riding to work, the Viale has all the necessary mounts to fit mudguards and racks and will take 30mm tyres with ‘guards and long-reach brake calipers. They’ve added a third water bottle mount too, for those longer rides. 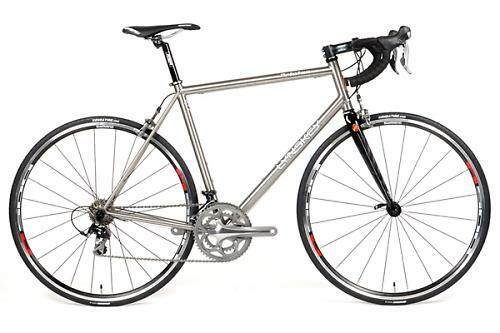 delivers world class performance and quality at an unheard of value,” stated Mark Lynskey, co-founder of Lynskey Performance Designs. We had a chat with Mark Lynskey last year about disc brakes on road bikes, flick over to that interview here.